Premier Products for Radio Controlled Models! "I now have 3 vectors, spread across 2 fixed wings and a quadcopter. Simply the best flight controller on the market, there isn't a single competing product on market for the OSD, truly industry leading. Great job, keep the firmware updates coming!" 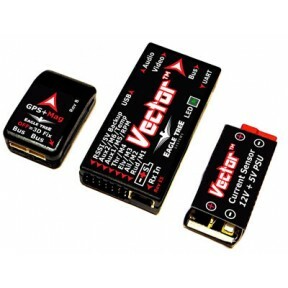 "I have now bought two of the Vector Units because I basically fell in love with the first one! I know it say's in the description; "We haven't tried this on larger aircraft" but I actually successfully use it constantly on my Giant Scale Top Flite P-51D Mustang! I haven't tuned it to where it will land itself yet but if I get into trouble or my gas engine craps out, I flip a switch and glide her in, I don't know how they did it but these guys certainly have the Flight Controller's down to a science! I use the other one on a almost 600 sized (558mm) Quadcopter, same story with it. The only difference is the Quad is running the V2 GPS/Mag and the Plank is running the V1, and the plank also has the airspeed and InfoPanel Display. But I am about to purchase the V2 for it and the InfoPanel for the Quad. Don't waste your time (and of course, money!) buying all those other FPV systems like I did, stick with the guys who have done it for years! That Giant Scale P-51D has approximately $2500 work of electronics; from the Hitec Telemetry, all 10 of the HiTec Digital Servos, Engine electronics, electric Robart Retracts, the small pneumatic system I have for landing gear doors and probably several more things I can't think of right now! Out of all this work, money and time that I spent building, installing, fiberglassing/painting and etc. I wanted a proven system, the Vector has saved me from destruction too many times to count and I will not fly without it! But don't just take my word for it, try it for yourself and you'll be just as amazed as I was! Just wanted to say thanks to all of the Vector guys, this system is phenomenal, Jeremy, Aiken, South Carolina "
"That is just so awesome, bending over backwards to meet my shipping needs (yes, putting the customer first) and all off of an email that normally would have gone through (yes, I was so bold as to respond to a computer generated response to my order). Clearly you guys are a class act with a classy product." "It seems to me every serious modeler would want to get a Flight Data Recorder to monitor his, and his airplane's performance. " "I have a few 2d 3d stabilizers and would like to report the they are awesome. Most of all when I have had a problem with one of them Eagle Tree's customer support has been outstanding. Just sent one back and the turn around was less then a week they sent me a new one know questions asked. That's how you keep your customers coming back. Well done Thank You"
"We fly the Guardian on about 7-8 planes from 2400mm Warbirds to skysurfers etc. Very good product and far superior to your competitors. We regularly fly in conditions that ground our friends. Also, my father flies planes with the Guardian that he'd normally wouldn't even try. In his words "I would leave home without it.”"
"Eagle Tree Systems' Flight Data Recorder is an amazing device...the guys in the club will eat this one alive. " "I have owned other osds and the vector by eagletree is the best and easiest out on the mark today ( oct 2014 ). Rth works out of the bix and getting it all set up is fast, easy , and convenient. This product is also made in the USA so we know its quality..."
"LOVE IT! LOVE IT!! LOVE IT!!! 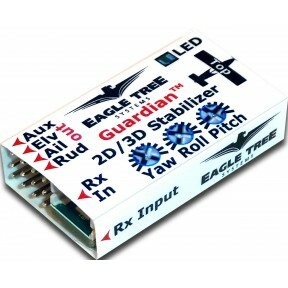 Eagle Tree Vector is an amazing product. I put my vector in my new FPV Penguin. With this being my first fixed wing aircraft, I waited weeks to fly it until I had the safety features that the Vector offers. So glad I waited. " "After using these (Vectors) for just about a week I have to say you guys literally knocked this product out of the park. I've not seen something that worked this well and was as intelligently designed while still staying intuitive and relatively straight forward in a very long time. I will definitely be spreading the good word." "Any way you look at it, the CDR is something that I have been hoping for. If you are an information junkie like me, you'll be ordering yours today. (Product rating: 10 out of 10)"
"I've done a lot of reading and researching over the last 6 months while waiting for vector, I am really new to multi rotors, with the exception of the submenu setup, I cant believe how easy it was to configure. I've fitted mine to a TBS disco and out if the box settings work perfectly for me. Only thing I changed was the altitude gain by +5. Really I couldn't be happier." "Thanks for your amazing Glide version. With the Glide, I caught 3 major thermals, and had many, many more indications of lift areas. I would not have located many of these without the Glide. " "Thanks Eagle Tree Systems for the great gear. Your customer service is brilliant, and your products are even better. The technology in the Vector is impressive, and it's rock solid. Keep up the good work! " "The potential ramifications of using the FDR are so vast that it is difficult to imagine all the ways it might affect our hobby." "In my opinion Eagle Tree staff and products are way ahead of all of the suppliers I've dealt with. They seem to really care about and how to help you learn and how to use it. Keep up the good work. AWESOME product." "I recently installed a Guardian into my Hangar 9 30cc Spitfire to help with yaw management. I'm very happy to report that I find your product performs excellently. I am now able to land in a full crosswind & the aircraft simply tracks wherever I require. I would never have thought that with the elliptical wing on the Spitfire a crosswind landing was possible without an inevitable wing tip scrape; however your Guardian can make a smooth landing possible in these challenging conditions making the pleasure of flying more accessible & not dependent on the wind conditions. Thank you very much for a great product. " "I LOVE my Gaurdian in my H&M Performance Spitfire! (60 sized electric) Installed it last season and it really smooths out my windy day flying! We get a lot of that in West Texas." "Just wanted to drop you a line and comment about how happy I am with my V3 eLoggers…. The system works perfectly! " "I just wanted to give some praise to those who work on support for the vector. The response time on my tickets have been super fast! We are talking minutes here. It have been constructive responses and it have helped with the setup and tuning. Other companies can learn a lot from you!"